Every since I learned how to properly use makeup brushes, I've used them ever since. Rarely do I apply my eye shadow with my fingers because I have become so accustomed to the ease and technique of a brush. Here is a look at the brushes I use regularly (if not every day) to apply my eye makeup. 1. Laura Mercier All Over Eye Color Brush - Though this is actually a travel size, the brush is one of my favorite brushes. It is perfect for applying color on the lid and gives great coverage with little to no fallout. And it fits on my lid as if it were made for it which makes application so easy. 2. MAC 212 Brush - This is my brush I use for powder or cake liner. I have been moving more towards gel liner over the past two years but occasionally I will still use a powder liner and this brush allows me to get an extra thin line close to my lash line. 3. Laura Mercier Pony Tail Brush - Hello most amazing crease brush EVER! I absolutely adore the shape of this blending brush and love the super airbrushed finish it can give my crease. This along with the All Over Eye Color Brush are probably the brushes I use every day regardless of the look I am doing. They are vital to my makeup routine. 4. 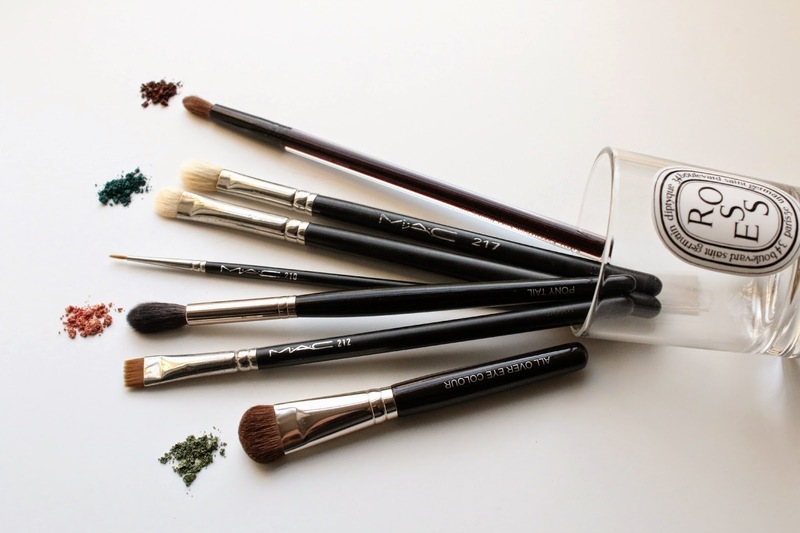 MAC 210 Brush - Though super small and dainty, this liner brush is extremely easy to work with and surprisingly sturdy. I use it to apply my gel liner and find that it makes the process much easier than I imagined it could be. I am awful at applying liquid liner and was afraid I would have the same issue with gel liner, but this brush has made all the difference. 5. MAC 239 Brush - This is a classic MAC brush and one that you will most likely find in almost every makeup artist's brush belt. I have 2 or 3 of these and have been using them for about 8 years - that is how long they last and how great they are to use. I typically like to use this brush for cream eye shadows and shadows that I want to apply with intensity. The tightly packed bristles makes all the difference when using highly pigmented shadows to ensure you get an intense pay-off. 6. MAC 217 Brush - In addition to my Pony Tail Brush, this is my second favorite blending brush for the crease. Because the shape is a bit more narrow, it is better for using on the outer corners of my eyes when adding a darker shade into the crease. The tighter bristle shape allows for a more precise application and blending of the color - which works for me the best when I am doing a smokey eye look. 7. Kevyn Aucoin Small Round Tip Eye Shadow Brush - This is the final brush in my blending trio and is best for a super precise crease look. It is small enough to really get into the outer corner of the eye perfectly, yet the bristles are soft enough that they can blend a dark color seamlessly. I also use this to get a soft smudgey look on my upper lash line when I don't want a harsh liner but rather a soft and smokey effect. 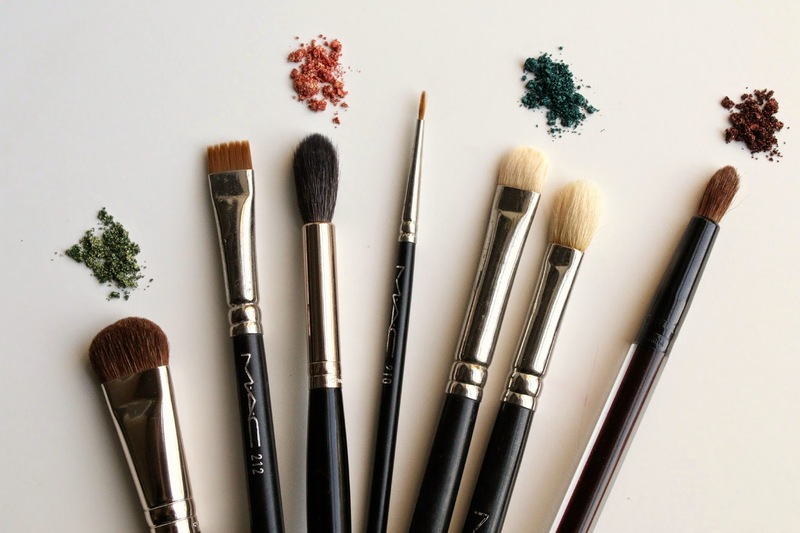 What are your favorite eye shadow brushes to use? I've been using the Real Techniques starter set for the eyes and a couple of brushes from Sephora and Eco Tools. But I feel like I'm still missing something similar to the 217 from Mac. The 217 from MAC is truly one of the best brushes I own. Worth the investment!